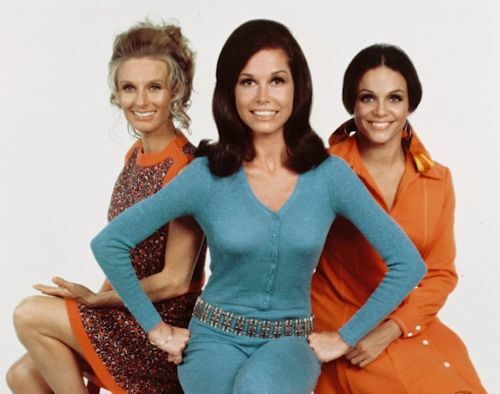 TV Land announced that the ladies of Hot in Cleveland will soon be getting some special visitors in town as Mary Tyler Moore, Valerie Harper and Cloris Leachman reunite with their co-star of The Mary Tyler Moore Show, Betty White and recurring star Georgie Engel. In the episode, Elka (Betty White) and Mamie Sue (Georgia Engel) decide to get their bowling team back together, aptly named GLOB: the Gorgeous Ladies of Bowling. The team, which includes Elka, Mamie Sue, Diane (Moore), Peg (Leachman) and Angie (Harper), had a falling out decades ago after their championship season went to their heads. This is the first time in over 30 years (since 1977) that the five former female castmates will be reunited on the sitcom stage. Mary Tyler Moore previously appeared on Hot in Cleveland as Elka's cellmate in a season two episode, but this will be a different character. Gavin MacLeod and Ed Asner are the only ones missing in this reunion episode (though Asner guest starred last year on the sitcom). The Mary Tyler Moore Show reunion episode is taping in front of a live audience on Friday, April 5 at the CBS Studio Center in Studio City, CA and will also guest star Jesse Tyler Ferguson (Modern Family). 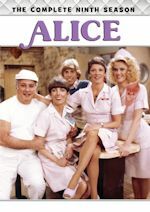 It's going to be bittersweet with Valerie Harper going through terminal brain cancer. It's so great they will reunite one last time. It is slated to air sometime in August, and we will let you know when exactly at a later date. As we all know, Hot in Cleveland returns for its remaining season four episodes with a LIVE (in the east) episode on Wednesday, June 19 at 10pm ET. 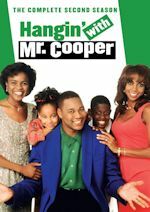 The sitcom has 12 more episodes to air in season four. In more Hot in Cleveland news, we are getting a season five as well! TV Land has renewed the sitcom for a fifth season and it will being it to a milestone mark. The 24-episode order brings the series to a total of 104 episodes, surpassing 100 episodes. This past January, CBS Television Distribution announced that it has sold Hot in Cleveland to TV stations in 92% of the United States for a September 2014 launch. Now these stations can expect at least 104 episodes to air five days a week beginning in Fall 2014. 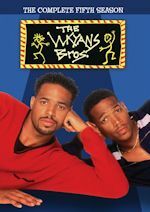 The fifth season will start taping this Fall and will likely start airing in early 2014 and be split up in two halves of 12 episodes again. Fox's Tuesday adorkable sitcom starring Zooey Deschanel airs Tuesday nights at 9:00pm and we have just watched the next episode that airs tonight (March 26). We have special guest appearances by Emmy Award winner Margo Martindale and Nick Kroll. 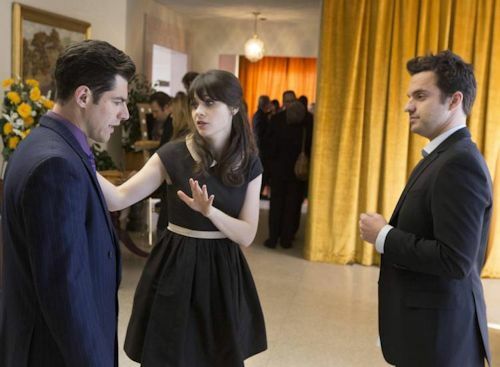 In the episode airing tonight, "Chicago," Jess (Zooey Deschanel), Schmidt (Max Greenfield) and Winston (Lamorne Morris) accompany Nick (Jake Johnson) back to his hometown when his father suddenly dies. 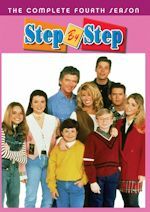 Once there, Jess realizes just how responsible Nick can be when she meets Nick's boisterous family members, including his mom, Bonnie (Martindale); his younger brother, Jamie (Kroll); and his cousin from Boston, Bobby (guest star Bill Burr). Meanwhile, Winston helps Schmidt get over his fear of death and Jess pulls out all the (musical) stops when she helps throw a wake fit for a king. Jess brings in some balloons from a guy she bought in a van. Nick gets a call from his mom that his dad has died of a heart attack in Chicago. After inhaling helium, they try to console him with their changed voices. The gang travels to Nick's hometown of Chicago for the funeral. Nick's mom asks him to make the funeral plans. Nick's father wanted a funeral like Elvis had, complete with an Elvis impersonator. Nick is asked to write the eulogy for his father, but he is busy making other arrangements and asks Jess to write it. Meanwhile, Schmidt tells Winston that he can't go to the funeral because he is scared of death. Winston later pretends to be dead in a casket to help get over his fear. Jess talks to Jamie and Bobby to gather more information on Walt for the eulogy. Nick continues to make phone calls. He later brings back a drunk guy to appear as the Elvis impersonator. Bobby learns that a chain that Walt is wearing may be his father's and tries to reclaim it. After the Elvis impersonator passes out, it's up to Jess to step in and help out. Nick remembers his father with a heartfelt speech. Everybody later joins together and sings. That's how Walt would have wanted it. As the episode closes, we learn that Nick's brother has plans that may lead to another family gathering in the future. NBC's Tuesday freshman comedy produced by Ryan Murphy airs Tuesday nights at 9:30pm and we have just watched the next episode that airs tonight (March 26). John Stamos returns for another episode. 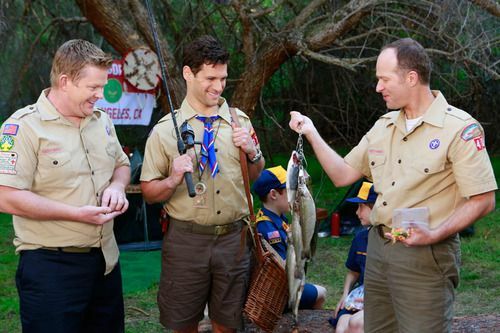 In the episode airing tonight, "About A Boy Scout," despite Bryan's (Andrew Rannells) concerns, David (Justin Bartha), a former Eagle Scout, jumps at the chance to chaperone a Boy Scout overnight with his friend’s son. His skills earn him the respect of the other fathers and scouts, but when one father disagrees with his lifestyle, David's Boy Scout membership is revoked. 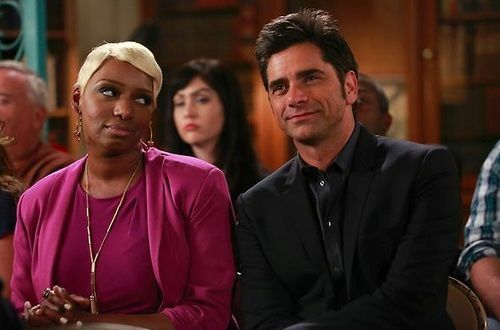 Elsewhere, Rocky (NeNe Leakes) is helping Goldie (Georgia King) sort out her secret crush on Brice (guest star John Stamos). David brings his friend's son, Danny, home after a hike in the canyon. He is an Eagle Scout for life and wants his son to one day be one, despite their stance excluding gays. David is offered the opportunity to chaperone a camping trip. Bryan later suggests that they have a scout meeting at their home. David introduces Bryan to the troop. Bryan later reads a letter that David's membership is revoked. David talks to the leaders to see who reported him, but nobody will tell him who contacted the organization. One of the fathers eventually admits to David that he was the one who called the office and tells him why he doesn't want David to be his role model because of his lifestyle. David thanks for him for his honesty. He later tells the troop he can't be their leader, but that he will continue to fight for change. In the secondary story, Rocky attends a Loveaholics meeting and talks to Brice. She also helps Goldie deal with her secret crush on Brice.